Providing an opportunity to combine theoretical training with hands-on media production is critical to students’ success. The Inc is an innovative and welcoming space where this kind of work happens. The studio and control room are where students get hands-on training with professional production equipment and processes. The editing suites are equipped with industry standard technologies where students learn post-production techniques and hone their storytelling craft. The conversation areas facilitate collaboration, feedback sessions, networking, and showcasing of student projects. A series of lively talks with creative practitioners and scholars working in a variety of media industries including radio, social media, television, marketing, and storytelling. Conversations at the Inc are guest discussions and demonstrations in which students gain valuable insight and consider the latest trends and foundations that are shaping communication in the community and beyond. Interactions with professionals who face these issues daily complement in-class projects and clarify the challenges students will encounter in a variety of careers. Students enrolled in theory and production courses are presented with current challenges that a business or organization struggles with on a regular basis. After talking to the business leaders, the students address the issue using media tools and practices. For example, many companies face brand awareness problems with younger customers. A representative from the business poses the challenge to the students, who then research the company and its audience. The students then create media solution modalities, flexible new media projects that address the challenge. They also create creative plans for longer-term solutions. Students benefit from these experiences by learning from industry leaders who share their successes and challenges. This gives students insight into how their coursework is preparing them to meet some challenges they will face in the workplace while also helping them establish a network of professional connections. 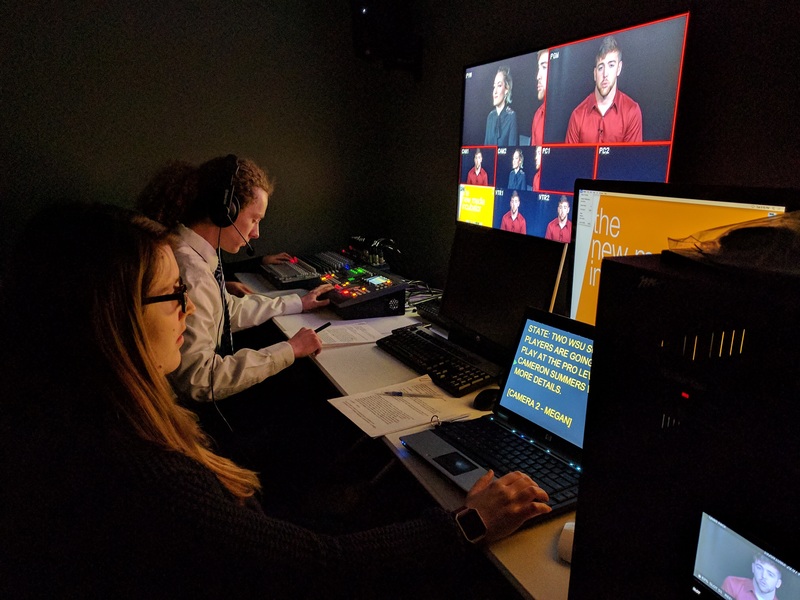 Practitioners/organizations benefit by having students participate in solving real problems they are facing while getting to know the full potential of Wright State’s award-winning COLA students who exhibit their passion, creativity, and promise through new media for storytelling. These opportunities are only the beginning of innovative and exciting collaborations between community and organizational partners and The New Media Incubator. *Note: The studio and control room will be unavailable for reservations March 20, 2019–April 3, 2019. If you have a project idea or would like to learn more about the New Media Incubator, use the button below to tell us more about your idea and we will contact you to schedule an initial consultation. Support our students! Your donations help provide internships.